Last edited by Eterne; 01-20-2019 at 03:29 PM. 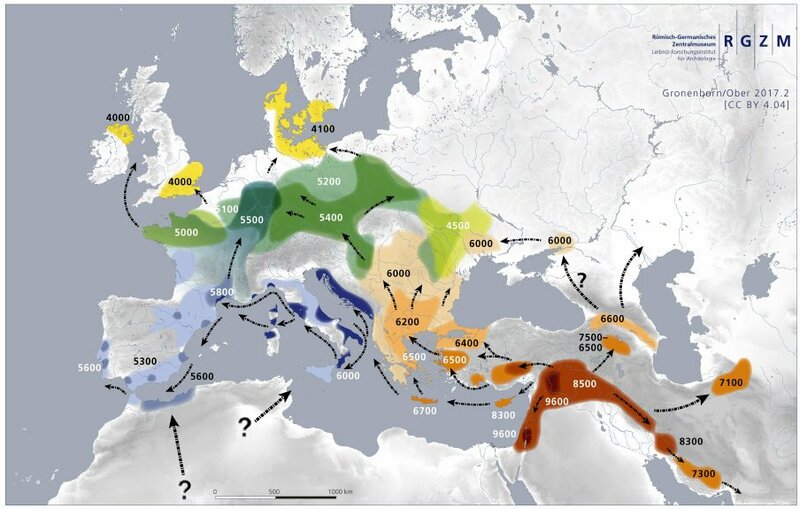 The mainstream idea is that they probably where Anatolia+Iberian HG, along with some other HG picked up en route and genetic drift, and some ongoing mixture past the initial founding of the Iberian Early Neolithic. The Iberian HG were likely richer in Magdalenian (El Miron) ancestry. The distinctiveness comes about from these tendencies, and also possibly is easier to detect on PCAs because their ancestry is relatively well preserved in Iberians. There is no sign that they came from a different founding population than Anatolia yet, though it can be very hard to distinguish between what is from drift and an ancient subpopulation structure we don't know about yet (like in the thread about Eastern Europeans and Baltic BA). (One good point about this map is to clear up the difference between an out of Iberia movement and a forking split between an into Iberia and into NW Europe movement, along the Cardial route. Though there would probably have been continuous contact after this anyway). Im not sure but they seem to me to be some sort of distinct population. Not Anatolian farmers and not shifting towards WHG but rather something more radically western. Basques seem to be a mixture of them and some sort of steppe population, and perhaps dont have any Anatolian farmer ancestry at all? They are overwhelmingly R1b with little to no Anatolian haplogroups such as Ev13 and G.
Apparently there was no R1b-M269 in Iberia before about 2500 BC and the arrival of the steppe-derived Kurgan Bell Beaker people, so you have to cut the Basque R1b out of the original formulation. What about I0410 that was found in Spain and dated to ~5100 BCE? Outlier? Edit: Actually looks like this sample was R-V88. Looks like an African branch. So the point about the Steppe origins of R-L23 stands. Last edited by AbdoNumen; 01-20-2019 at 08:28 PM. ?a more HGmale dominant society +female exogamy from an AN rich(er) area? Last edited by alexfritz; 01-20-2019 at 11:17 PM.